Sandwiches and salads are a no-brainer for grab-and-go foodservice. They package, hold and transport well. Plus, these hardworking menu staples are popular with customers. Sandwiches and salads can even be adapted to a variety of different tastes, dietary preferences and dayparts. 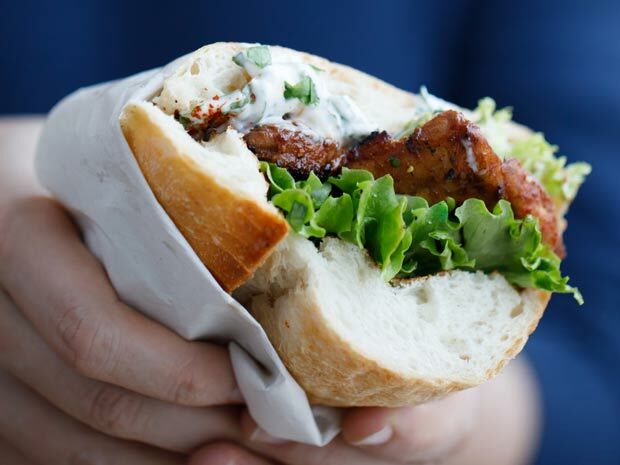 Prepared hot and cold sandwiches as well as entree salads are among the Top 10 most frequently menued grab-and-go selections, according to Datassential. Sandwiches, in particular, are supremely versatile: They work for breakfast, lunch and dinner as well as snacks. They’re easy to adapt to vegetarian and vegan trends as well as bold flavors and ethnic innovations. And sandwiches represent the ultimate in portability, requiring nothing more than a napkin to fully enjoy. Salads are no slouches either when it comes to versatility. They adapt well to every post-breakfast daypart, and are appropriate as an appetizer/snack, main course or side. That salads can be meatless goes without saying. And the salad category has become increasingly exciting in recent years, encompassing everything from greens and vegetables to grains, beans, noodles and on-trend proteins. Grab-and-go sandwiches and salads can be every bit as delicious and distinctive as their dine-in equivalents. These pre-prepared items do need special consideration because of grab-and-go constraints, however, especially in terms of holding and portability. Excessively wet or messy sandwich fillings, for instance, are difficult in grab-and-go settings. Wrap sandwiches are popular because they do a particularly good job at containing all the elements and allowing each bite to contain every ingredient; they’re also very neat to eat. While customers still love the traditional sandwich favorites like subs, chicken, turkey, and cold cuts, according to Datassential, there’s a lot of room for innovation within the sandwich category. Depending on your clientele, you can give standards a little twist. Instead of tuna-mayo salad, for instance, offer a Tuna Nicoise Sandwich with sliced red potatoes and hard-boiled eggs, marinated string beans and romaine on Italian bread with olive aioli and capers. Add global touches with condiments like Korean barbecue sauce or Latin adobo. With salads, sturdy ingredients tend to work best. Using delicate lettuces or fresh herbs will limit the amount of time the item can be merchandised. Tossed and composed salads should be packaged separately from the dressing. On-trend grain and Asian noodle salads, marinated vegetables, Cobb and other classic composed salads, Greek salads and the ever-popular Caesar—with or without a protein topping—all work well for grab-and-go. Experiment with different sandwich breads such as croissants, rolls, focaccia and various wraps in addition to the usual white, wheat and rye. Make sure to offer a few better-for-you sandwich choices with lean meats like turkey, gluten free bread or healthy-halo ingredients like chopped vegetables and vinaigrette dressing in a wrap. Give a shout-out to local and seasonal ingredients such as artisanal cheeses, farm-raised fruits and vegetables and heirloom tomatoes. Offer weekly sandwich and salad specials to keep customers interested and encourage repeat business. Package salads in oversized containers that allow customers to dress and toss them easily; tightly fitting lids allow for some salads to be shaken in their containers. Name and merchandise salads to take advantage of the popularity of bowls—with a variety of ingredients, composed so that all are visible. To read more about the latest grab-and-go dining trends, download this informative trend report here.